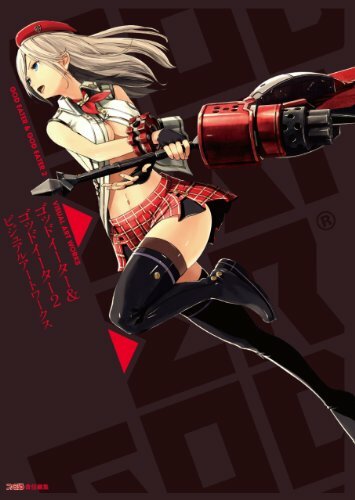 This is the video game artbook for God Eater and its sequel God Eater 2. It also includes art from the first game's expansion God Eater Burst. It's a thick 288-page paperback. Half of the book features character designs, and the other half is split between the creatures called Aragami, environment art, weapons and miscellaneous drawings. The wonderful anime style character designs are from Koichi Itakura and Sokabe Shuji. Main characters have a full page standing portrait and a close up, followed by the various other designs which consist the poses, sketches, weapons and notes. The colouring is not just the typical flat anime style, but there's a slight texture overlay which makes the drawings look more interesting and beautiful. The creatures, the Aragami section, has the designs produced at medium and smaller sizes which is too bad because they have a lot of details. The graphics here consist of in-game screenshots in 3D and the concept art for those creatures. As all the 3D creature graphics are in a section together, you have to flip back a few pages to see the corresponding concept art for any particular creature. It's quite inconvenient with all the flipping when compared to how they presented the characters. The other strange thing there's no anime style rendering of the creatures. The environment artworks are nice but I feel they lack a certain grandeur. But well, they are from the game. Weapon and armour designs are pretty cool as usual. The last section of miscellaneous drawings are fan art illustrations, good but not as good as the 30 over pages of fabulous splash art that appear right at the beginning of the book. The book is sort of a mixed bag for me, but a good mixed bag overall because a good portion of art is devoted to character and creature designs, which are the highlight of the book.